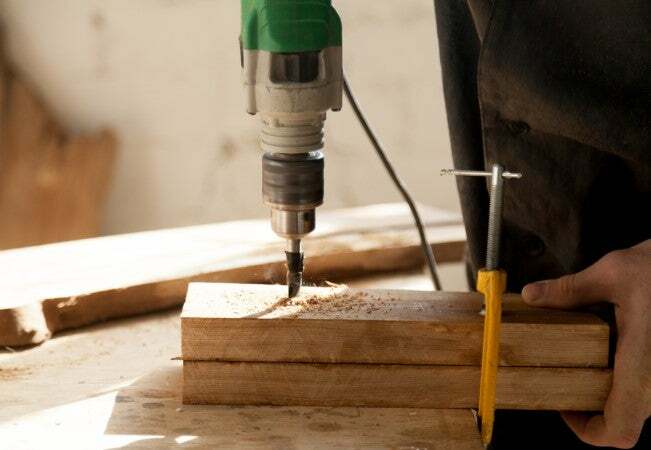 The next time you need to screw or nail two pieces of wood together, first invest a few extra minutes in prepping the project with pilot holes. These surefire tips will help simplify the project and save your wood from damage. Q: I know it’s a good idea to pre-drill before nailing or screwing two pieces of wood together, but I can’t seem to get the hang of the technique. Any tips for me? A: Yes, creating what are called “pilot holes” will help prevent your wood boards—solid or MDF—from splitting or cracking when you drive a nail or screw through them. The small holes also mean you’ll use less force when nailing or screwing into hardwoods, like maple and oak, and keep the fastener from bending or angling out of line during insertion. Ultimately, even though starting with pilot holes means you’ll do twice the amount of drilling, you’ll actually make up for the extra prep time by eliminating problems that might slow down or stall the project. Considering their usefulness in a range of projects, it’s smart to study up on the right way to drill pilot holes. With the following key tips and some practice, your next project should come together with ease. Mark the spot with pencil or tape before you begin. Mark the spot in pencil. Or, better yet, create an “X” with painter’s tape over the location for your nail or screw. The tape will reinforce the wood and offer extra protection against possible cracking. Create an indent that your drill bit can grip. Once you’ve determined where your pilot hole will go, use the tip of a nail or an awl to create a slight indentation over the spot. This will keep your drill from slipping out of place once you begin to drill. Choose the right size drill bit. 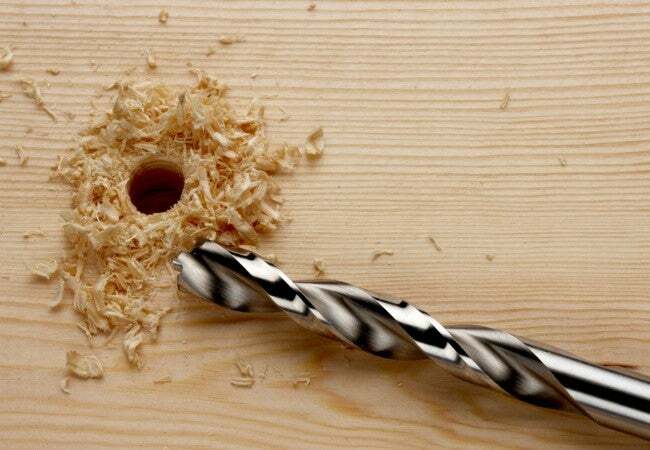 If you are creating a pilot hole for a nail, the right drill bit is slightly smaller than the nail’s shank. If you are creating a pilot hole for a screw, the drill bit should be the same size as the body of the screw—not including the threads. While there are charts showing the appropriate size drill bit for various sizes of screws, you can do without by comparing drill bits to the screw until you find the one that matches. Hold the screw up in good light to make the task easier. The right drill bit covers the screw’s body, but not its threads. If you don’t have an exact match, go with the drill bit that’s slightly smaller than the screw’s body. Clamp your wood boards to steady them. To prevent the top board from slipping or shifting ever so slightly as you drill, you may want to clamp them together, or even squeeze a bit of wood glue between the two boards (bonus: this strengthens the joint) and then clamp. 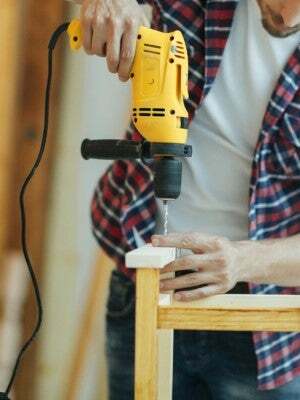 This extra tool leaves both of your hands free to make sure that your drill is completely perpendicular to the wood. Keep your drill bit perpendicular and slowly drill your pilot hole. Before drilling into the wood, don protective eyewear so that you aren’t irritated by sawdust that flies out of the pilot hole. Then, place the tip of your drill bit into the indentation you created earlier, holding the drill so the bit is perpendicular to the wood. Start off with your drill set to low speed. Accelerate slightly if you feel confident you can control the drill; otherwise, stay on a low speed. Drill until your pilot hole is the same depth as the length of your screw or nail. Many experienced do-it-yourselfers can eyeball the depth, but if you aren’t yet that experienced, you can use a drill stop to mark the appropriate depth. In a pinch, you can even use a bit of tape or a twist-tie to mark off the screw’s length on the drill bit. Once you hit the right depth, slowly back the drill bit out of the hole while continuing to keep the drill perpendicular to the wood. Now you can go ahead and install your nail or screw. Achieve a rough pilot hole without a power drill. While a power drill/driver makes quick work of both drilling pilot holes and inserting screws, not everyone has one handy. 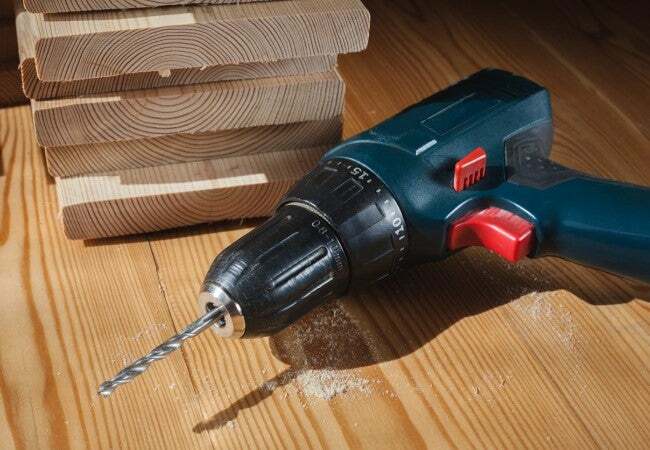 In a pinch, you can still make a pilot hole by choosing a nail that’s the same size as your screw’s body, and then carefully hammering it straight into the wood to the appropriate depth before pulling it back out. Then, use a manual or powered screwdriver to complete the rest of the project.